Some of you may have had the pleasure of meeting the BMMI Djibouti team. They consider themselves a ‘family’ and operate through a set of shared values that are fundamental to everything they do. Leading this team is Country Manager, David Hanse. David is an enthusiastic and passionate leader. Our colleagues are a group of strong and talented people, but making them work effectively together is a different task. As a leader, that is exactly what David does. The team works cohesively together in order to perform better. Executive Vice President (EVP), Marek Sheridan recently visited BMMI Djibouti for the first time, with Chief Operating Officer (COO) & EVP Robert Smith and Vice President of Africa, Olivier Fricot. 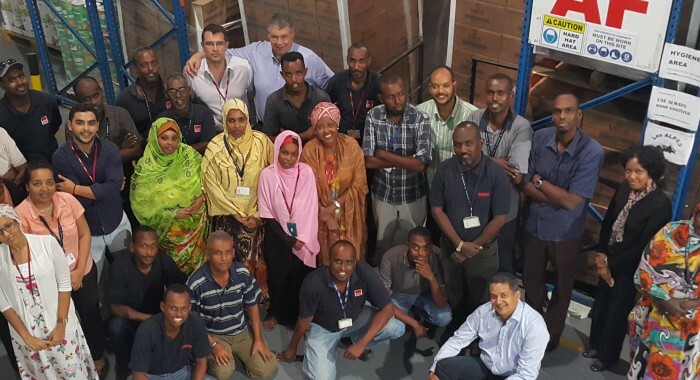 The three-day visit, which took place earlier this month, was to introduce Marek to his colleagues, and give him the opportunity to learn more about BMMI Djibouti, as well as take a tour of the facilities. During his visit, Marek visited the container terminal, met with important representatives and go to see the first mall construction in Djibouti. However, it was the team and David’s leadership that left an ever-lasting impression with Marek. Recently, the team visited the BMMI Bahrain offices for Vision 2000 training. Amina Abdi Souleiman, Lalanirina Randrianantenaina and Vipin Sagar made a month long visit to Bahrain in order to familiarise themselves with the financial accounting and management information system. Whilst in Bahrain, the three worked double shifts and attended training during the day, and once it was over they ensured that all their emails were checked and deadlines were met. Whilst the trainees were away, the team in Djibouti did an excellent job managing the fort and ensuring that operations were running smoothly. Marek reinforced the fact this is all down to David and his leadership style that increasingly embraces and celebrates teamwork where it’s about creating a star team rather than just star employees.